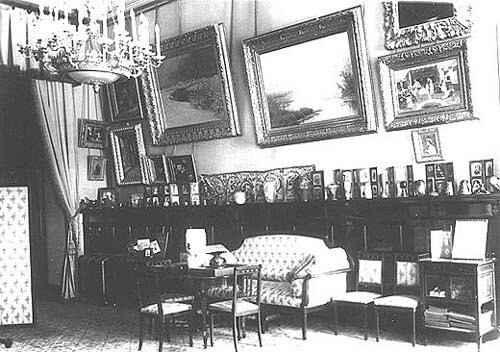 Above: The Pallisander or Rosewood Drawing Room; in the left-hand corner on the floor can be seen Alexandra's special chest containing her personal memorabilia. Before the construction of the Maple Room this was the primary Sitting Room of the Imperial apartments. Nicholas describes this room as the green "Chippendale Room" in his early diaries. At the time the wooden corner fireplace in the room, with its cornices and many shelves was seen as a "Chippendale" piece. Nicholas and Alexandra liked this room and during their fist years in the palace it was one of their favorite cozy spots to be alone. The walls were hung with pale straw-green silk and the floor was laid with British carpet woven with a diamond pattern with a wreath motive in shades of soft purples. From the center of the room hangs a large gilt-bronze and crystal chandelier in the Empire style. Left: The fireplace corner in the Pallisander Room. 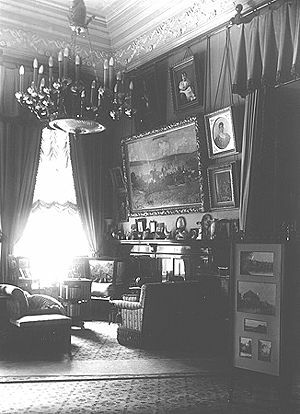 Nicholas and Alexandra personally chose the paintings to be hung in this room and they intended their selection to indicate their own personal tastes. 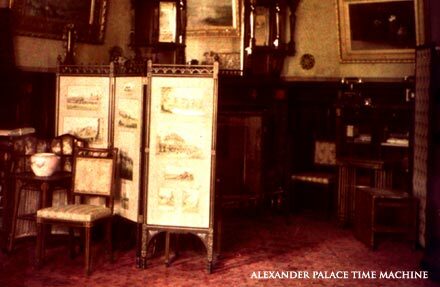 The two on either side of the fireplace were new paintings purchased by the Empress specially for this room. The one on the left is "The Annunciation" a work in Art Nouveau style. The painting on the right is a "Madonna and Child" by Paul Thuman. Alexandra also brought a painting of her father by Plueskow which was done in 1894, and a painting of her mother, Princess Alice of Great Britain and Ireland which was a copy painted by Kobervein. The largest painting in the room was a huge canvas of Romrod Castle in Hesse. There were also works by famous Russian artists and a watercolor by the English painter Sir Edward Poynter, which was purchased by Nicholas on a trip to Great Britain. On the screen in front of the fireplace are watercolors of Alexandra's childhood homes in Hesse. The fireplace has a grass screen in front of it and it's shelves contain pieces of Danish porcelain from the Royal Copenhagen Factory. In the center of the mantle is an Art Nouveau clock with pieces of Gallé and Russian art glass on either side. Intimate guests and visitors to whom the Tsar or Tsarina wanted to show special favor were invited to this room, which was a part of their private chambers. Warm, highly polished rosewood panelled the room. Meltzer custom designed furniture for the room which was crafted in his family's workshops in St. Petersburg. The material chosen for the furniture - rosewood inlaid with delicate motifs in rare, contrasting woods - matches the panelling. The style of the room is typical of English-style interiors of the time and is similar to one shown by Bing in his Paris Exhibition of the same year. This rooms was published and widely admired. English-style interiors were characterized by the use of high wood wainscotting and contrasting textures in materials used to decorate the room. Here in Meltzer's interpretation he takes the older English Arts and Crafts Movement and blends it with subtle elements of the then emerging Art Nouveau movement. 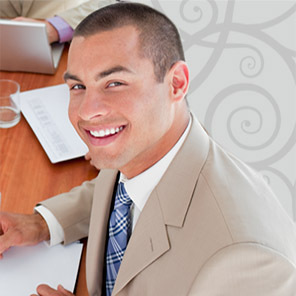 This can be best seen in the proportions of the furniture and use of new decorative motifs. Modern sensibilities can also be seen the plushness of the upholstered furniture, which were more comfortable than stuffed furniture of earlier decades. The fabrics used in this room were heavy tapestry weaves in muted Arts and Crafts colours. The British carpet matched the floor covering of the Mauve Room, although it was in a different color. The silk wall covering is a yellowish-green. The Pallisander Room could easily have worked as a dining room as well as a sitting room and was sometimes used for that purpose. This was often the site for the family's daily tea. 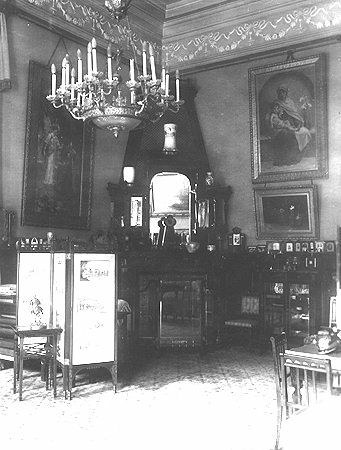 Right: The family sitting area of the Pallisander Room, where many photographs of the Romanovs were taken. On the wall can be seen the huge canvas of Romrod Castle. Above it is a painting of Aleksey; to the right is a portrait of Alexandra's mother, Princess Alice. Alexandra kept a memory chest filled with her personal treasures in the right corner of this room by the doorway to the corridor. In it she kept her children's baby clothes - as well as her own tiny infant things from Darmstadt - and mementos from Grandmother Victoria. Many of these are now at Pavlovsk. Here she stored the letters she wrote to the Queen which were returned to her by Edward VII on the death of Victoria in 1901. Alongside them were her diaries and the love letters Nicholas had written her during their courtship. There where also many pieces in the room by the firm of Fabergé, including a silver and pallisander wood chest in the Art Nouveau style Alexandra loved so much. The room also had two telephones, one to the outside and a special phone with a direct link to the Winter Palace. This phone was used during the dark days of the revolution when Alexandra was alone in the palace with her children, she kept in contact with the Winter Palace Commandant, General Ressin, via this line.